STUTTGART -- Daimler's profit growth will be dampened this year by spending on new technologies such as electric and autonomous vehicles, it said on Thursday, as it reported weaker than expected quarterly operating profit and a narrower margin for its Mercedes-Benz Cars business. An expected rise in unit sales and revenue in 2018 will be countered by spending on new cars and technologies, the German automaker said, forecasting earnings before interest and tax (EBIT) would come in at a similar level to 2017 for its car business and for the group as a whole. "Our outlook is dampened by currency exchange rates, as well as another expected rise of spending demands," CEO Dieter Zetsche said at the company's annual press conference in Stuttgart. Fourth-quarter earnings before interest and tax were flat at 3.47 billion euros ($4.3 billion), Daimler said, weighed down in part by a diesel recall that cost the company 425 million euros during 2017. Revenue advanced 6 percent to 43.6 billion euros. The quarterly return on sales at its Mercedes-Benz Cars division shrank to 9.7 percent from an unusually high 10.7 percent a year earlier, even as unit sales rose by 4 percent to 613,026. 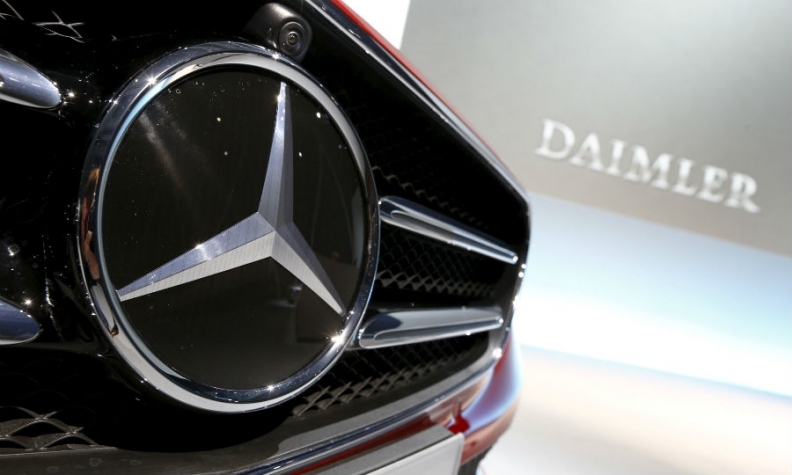 Evercore ISI analyst Arndt Ellinghorst said Daimler's results and guidance signaled that investment and exchange rate challenges are likely to hit profitability across the industry. "Of course we are aware of many of these burdens, but to see it black and white is still shocking," Ellinghorst said. "The outlook is a disappointment," Juergen Pieper, a Frankfurt-based analyst at Bankhaus Metzler, said by phone. "The drop in earnings at the cars division shows profit dynamic is lacking." Daimler's subdued outlook contrasts with a record run, fueled by demand for its new-generation E class and its widening range of SUVs. The company sold more cars last year than ever before, and posted record revenue and profit as well. Daimler said it faced currency headwinds, partly from a stronger euro, of up to 1 billion euros ($1.2 billion) in 2018, as well as 200 million euros in extra raw material costs and a further 1 billion euros in investments to "secure the future." Ellinghorst calculated this could amount to an additional 300 million to 400 million euros in extra restructuring costs and a rise of up to 700 million euros in r&d spending. "Daimler is not alone. It will be harder for all companies to maintain their profitability," said Ellinghorst, who has an "outperform" rating on Daimler shares. Most major carmakers are ramping up spending on electric vehicles and autonomous driving technologies, as well as services such as car-sharing, amid tightening emissions regulations and competition from the likes of Uber and Google. Daimler forecast that operating profit at the vans business will dip, with the costs of launching a pickup truck offsetting higher unit sales. Despite a continued rise in demand for cars in China this year, Daimler said it expected more moderate demand in the first months of this year. It also said it had set aside 3 billion euros toward its German pension plan. It will pay a dividend of 3.65 euros a share for 2017, compared with analysts' consensus forecast for 3.53 euros. Tightening pollution regulation is putting carmakers under strain to spend record amounts developing a fleet of electric vehicles. Daimler plans to invest 10 billion euros to release 10 new electric vehicles by 2022, even as demand for battery models remains low. The generational shift will increase development spending, already at a record, for another two to three years, the company has said. To meet the challenges, and fend off new competitors such as Tesla and ride-hailing company Uber, Daimler has started preparations for its biggest corporate overhaul in a decade. The manufacturer plans a holding company with three legally separate units, Mercedes-Benz Cars & Vans, Daimler Trucks & Buses and financial services. Shareholders, who favor a spinoff of trucks unit into a separately listed company, have criticized Daimler's opaque language about the process that has left vague the benefits of the costly exercise.